This morning it was raining. Just beyond a drizzle, nothing close to a downpour. Enough that when we left the hotel and began looking for the pastry shop Hannah had spotted down the street, we ran back for our umbrellas. The girls found theirs, but mine seemed to have vanished. If I ever actually put it in the bag. Packing has always been a last minute endeavor for me, so an umbrella may or may not make the trip. Looked like this time, it didn’t. This was our first trip to Paris, and the iconic tourist destinations seemed like they should be paid their respects. 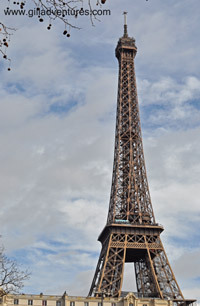 So, after a side trip to the Apple store to replace John’s computer power cord that was fried during that sparking, snapping thing earlier that tripped the breaker in our room, and another to the train station to get tickets for our trip to the Alps tomorrow, we set off for the Eiffel Tower. As we walked past the young men selling plastic keychain replicas of Gustave Eiffel’s most known work and stepped over puddles, I thought this was the perfect touristy morning. The sun warmed us as we stopped at the stands selling souvenir tchotchkys, the girls looking through postcards and junk to send home to their friends. On a whim, I bought an overpriced red travel umbrella with little Eiffel Towers on it, since mine seemed to have gone AWOL between taking it from the coat closet and putting it into the suitcase. As we approached the base, I looked out over the buildings across the Seine. Dark grey storm clouds dropped rain in another part of the city to the Northwest. We stopped several time to add our own photos to the world of a metal tower with blue sky and wispy clouds. I always love looking up at tall things like towers, light houses, or even tall buildings standing alone when the clouds are streaming past, creating the illusion of the building itself flying through space. The rain hit us the same time as the wind, just as we stepped under the flared base, an instantaneous shift. A tower of open metal beams doesn’t offer much protection from either. Umbrellas came out, including my little red one with images of the tower overhead sprinkled across the top. The wind pushed the rain sideways, standing behind the umbrella, rather than under it,was best. A crowd gathered against a building by the Ouest leg, huddled tight to the front, four Gills wearing umbrellas joining them. Tourists scattered as I held by camera behind my umbrella with me. Gusts of water laden wind soaked our pant legs, spray curled and drifted behind the umbrellas curved against its impact. I wondered about the people on the observation deck, and how we’d been talking about going up seconds before the squall. As abruptly as it came, it was gone. Blue sky broken with wispy white and calm, if humid, air. The bodies compressed against the wall relaxed and drifted apart, easing into the sun. I closed away my red umbrella dotted with gold Eiffel Towers and gently shook the water from it, knowing I’d found a new traveling friend.